Here's an excerpt. The full review is available here. "Best’s descriptive abilities are acute. She is able to convey to the reader the full passion of Martha’s swimming, from the physical sensations of the very act to the visceral release from the world on shore. Effective too is her description of dementia. John’s condition is portrayed thoroughly and accurately, but also sensitively, allowing his humanity to come through at the same time." For those of you who like being read to, I'm delighted to say that the audio version of The Last Wave is now available on kobo. The incomparable Noah Richler narrates! It's a really special moment when you encounter a reader really understands your characters and your book. This review by Rohan Maitzen is one of those: "Best tells a story of struggle and resistance with neither heroes nor villains—in which genuine errors, even ones that can’t be easily excused or forgiven, coexist with genuine virtues." I'm really excited about attending the ABA's Winter Institute, and meeting some of the amazing people who run bookshops in the States. It's been ages since I've been to the US and I've never been to Memphis TN! So much to look forward to... except the 3.45am taxi pick up time, but never mind, you can't have everything. I was an incredibly lucky high school student because I had a creative writing teacher named Sue McEwan who encouraged me. She was kind enough to introduce me at my hometown book launch this past August, and more importantly she was wise enough to see that I might one day become a writer. Without her encouragement I've no idea what I might have become. To read more about how influential and important she was in my life, you can check out this article I wrote for the Globe and Mail. 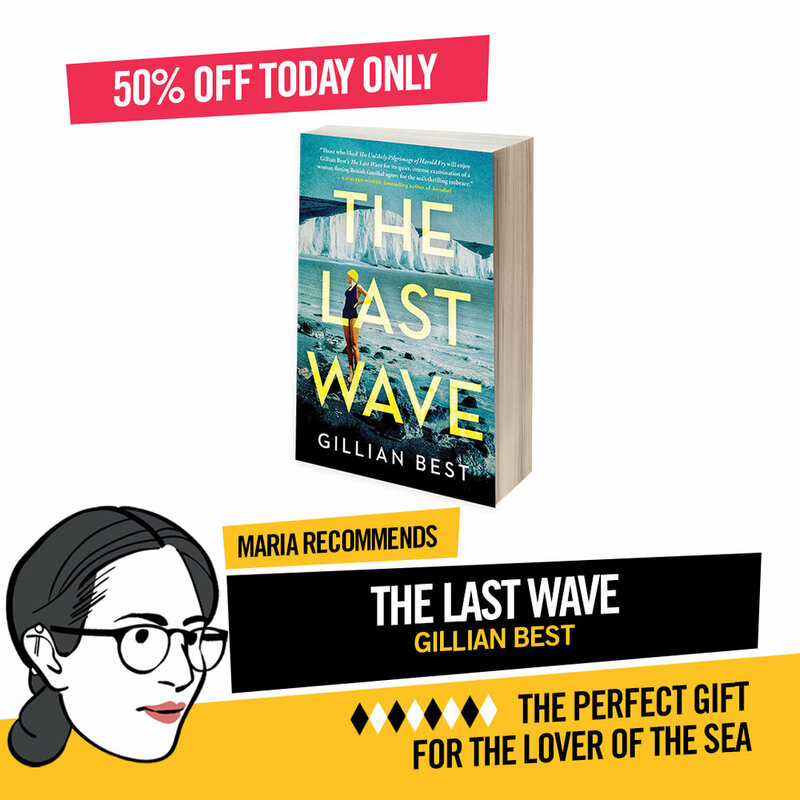 House of Anansi are offering a one day only super great deal on my novel The Last Wave today: 50% off! But one library in particular: the Waterloo Public Library. I spent years here as a child listening to stories and checking out as many books as I could. Most of which were returned. Most of which incurred a fine. Some fines were bigger than others... such as the fine I paid when I returned home from studying in Glasgow, and got a new library card. Apparently there was a book overdue from sometime in my high school days. How lovely, then, to see that the library featured The Last Wave in their promotional flyer. Also, how great is it that, in with all the adverts for big screen TVs and washer-dryers, there's an advert for the library? 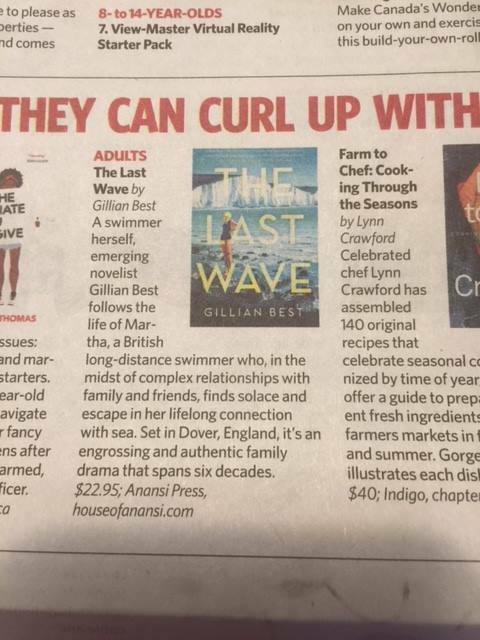 Delighted that the Toronto Star included The Last Wave in their holiday reads round-up. Great to see The Last Wave included in this round-up up women who shake things up. Check it out the Toronto Star. "Novels where women shake things up — from the social order to family dynamics to pioneering new ground." "Something I admire about this novel is Gillian Best's commitment to the difficult. Best does offer her reader a resolution at the end – one that's only partway, but true in the way that life offers few full resolutions." Read Jade Colbert's full review here.